I've been meaning to show you this piece for like a month now!! I absolutely love this necklace, I've been wearing it alot! The blue really stands out and brings life to this piece. 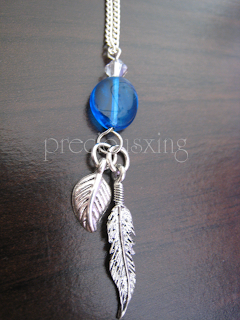 I thought that the leaf and feather were very pretty and natural and created a nice flow within the piece. This is one of my fav pieces, it's very me! Made with swarovski crystal bicones, blue glass bead and silver plated charms =) The blue bead is very unique as it has a slight dip in the centre. The top right and bottom left corners rise slightly higher than the rest giving the bead a sort of gentle wave effect shape, it's super pretty! You can make out what I mean in the pic above, there is a dark line in the centre (a reflection of something) which is distorted but it's actually reflecting the edge of a straight picture frame! I called this piece 'Freedom' because the leaf, feather and ocean blue bead all remind me of nature and nature is always associated with beauty and liberty. This is such gorgeous necklace!! You are super talented!! Love the feathers on it sooo wicked!!!! wow, that is a really lovely necklace!! 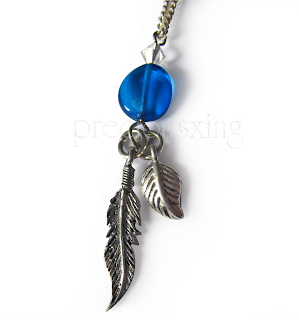 I lovee the combination of the leaf and feather charms, and you're right, this really does remind me of freedom. @Zarna Thank you so much =) So glad you like it! Hi Rachel, thank you so much for your sweet comment *O*. & Thanks for being a follower too ! Of course I will check your blog n__n. I really love this necklace :'O. Just in case you want to participate, I'm doing a giveaway on my blog... Hope to see you back soon! @Dianonkey Kong Thank you =) Your so sweet! thanks for your comment and following me! this is such a pretty piece.. you are really talented! wished i could do that too!